How About an eBook Vending Machine? You are here: Home / E-Book News / How About an eBook Vending Machine? That’s what the two machines pictured above are. The top one, which is described as “specially made” in the article in Australia’s Courier Mail, is installed in an Australian Mary Ryan bookstore. The creator expects to install kiosks at six other bookstores and also provide sales people with iPad Minis on which the staff can order books for customers in real time and have them delivered to their homes. This is just the type of thing that indie bookstores need to do to stay relevant. 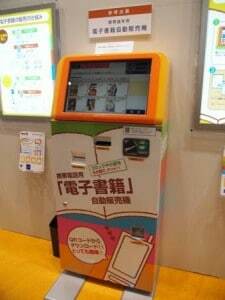 The picture below is is an ebook vending machine from Japan. According to Ubergizmo, the machine dispenses a receipt with a QR code on it which the user scans with his ebook reader or smartphone to redeem the book. This looks like a really interesting idea! A vending machine that dispenses QR codes is not one I would have thought of, but it could be one of the ost interesting vending machine business ideas I’ve ever heard of.